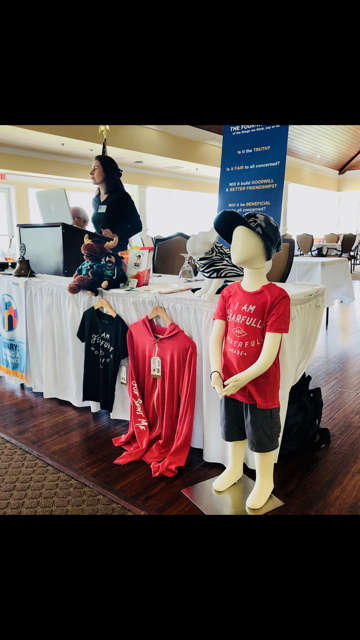 Our October 3rd Meeting was a heartfelt presentation that hit home, as North Myrtle Beach Rotary’s very own Jaime Grainger shared the story behind her foundation for children, PeaPot Jones! Jaime and her husband, Scott, started PeaPot Jones in late 2015, to aid families with children with rare diseases. The Grainger’s inspiration behind their foundation was from their own personal experiences with their youngest son, Josey. As a new born, Josey experienced a broken arm, which was initially written off as a non-serious occurrence by doctors. Then, just before his first birthday, Josey suffered a head trauma, which resulted in a skull fracture. After a frustrating and worrisome period of testing and a myriad of medical consultation, the Graingers received the sobering news that changed their lives forever. Josey was diagnosed with Osteogenisis Imperfecta Type V, a very rare brittle bone disease. After the troublesome road to diagnosis, the path to treatment was no easier, as locating specialty doctors and medical centers. In the exhaustive search for Josey’s treatment, Jaime found a Facebook Group of families that were dealing with what Josey was facing, and that support became invaluable. Through that group, the Graingers found The Montreal Shriner’s Hospital, one of the only medical facilities which provides treatment for Osteogenisis Imperfecta. There is no proper cure for what Josey has, however, Josey and the Graingers plan to make biannual trips to The Montreal Shriner’s Hospital for treatment until Josey is 18 years old. The assistance the Graingers received both socially and medically were major elements of support during this early chapter of their journey with Josey, but they thought the access to this support was far too difficult to find initially. Jaime and Scott started The PeaPot Jones Foundation as a channel to help aid families with children with rare diseases through connecting them to specialty medical care and providing financial aid. Why the name PeaPot Jones? That’s a nickname Scott would call Josey and their oldest son, Cashas, as babies, and the name stuck! What an inspirational story and cause from one of North Myrtle Beach Rotary’s Jaime Grainger. Her family and her foundation represent the true meaning of what it means to be a Rotarian: Service Above Self. We thank you Jaime for sharing your story with us, and look forward as Rotarians to help promote and assist The PeaPot Jones Foundation! Want more information on PeaPot Jones? You can read Josey’s full story, and donate to this wonderful cause by visiting their website, peapotjones.com.